How can you reach high places safely? Step stools come in handy when you need to reach just about anything. Whether you have high shelves in the school library, supply room or mailroom, stepping stools make it a whole lot easier to get to everything you need. With this convenient solution always on hand, no one will have to strain to gain access to supplies that are high up. Hertz Furniture has a great selection of step stools and step ladders, so you can find the style that fulfills your needs. All of our models are designed for maximum convenience and safety. A great step stool can save you both time and energy. Do I really need a step stool in my school? There are so many places in a school where a stepping stool can come in handy. Step stools can be an asset to school libraries. 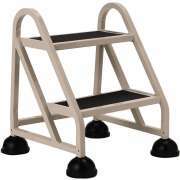 Rather than librarians having to strain, balance on chairs, or run to the supply room for a ladder, they can simply roll the step stool into place for easy reshelving. This great tool also makes it easier to read titles on high shelves so desired books can be located quickly. Because step stools are so compact, they can easily be kept around a library without taking up too much space or interfering with the ambience. 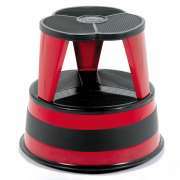 Step stools can really come in handy in classrooms as well. This is an especially good idea if your learning spaces have high bookshelves or storage cabinets. When each classroom has an easy way of accessing all materials in the room, teachers won&apos;t have to know what they need so far in advance, call someone for help, or leave the classroom to retrieve a step stool or step ladder. Stools can also be useful if you have a school and community partnership in which rooms are used for multiple purposes. Step stools allow you to store whatever is needed, even in higher places around the room, while keeping everything within reach. A step ladder is absolutely essential in a supply room. Because things are constantly being put on shelves and taken down, it is important to always have an easy way to get to them. When choosing a step ladder for your supply room, it is important to make sure that it will provide access to the highest shelves. 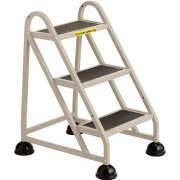 If, as in many schools, churches and offices, your supply room is really packed, a folding step ladder is a good choice because it conserves space when not in use. What is the difference between a step stool and a ladder? While both step stools and stepladders can help you reach high spaces, each model has its own distinct features and benefits. 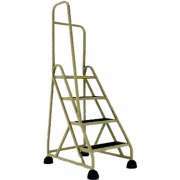 A step ladder provides access to items on higher levels. Many of our models have weight-activated retractable casters which make it easy to roll ladders into place, but also maintain stability when there is someone standing on the ladder. How do I know my ladder is safe? Safety is too important to be overlooked when purchasing any furniture. While all of our step ladders are built for security, some include extra features to ensure maximum safety. Handrails help to maintain balance, especially when one is standing on a high step. This is an especially important feature if you need to reach items that are high up. Non-skid steps are also an important thing to consider because they minimize the risk of tripping, sliding and falling, by keeping feet firmly planted. If the items you need to reach are never very high up, but still too high to be safely and easily accessed without a bit of extra leverage, rolling step stools are definitely an excellent option. They are designed for super easy transport and stable standing. Rolling stools never need to be lifted, but can simply be kicked to the desired location. Retractable casters ensure that stools will not roll when a person is standing on them, but enable them to be moved without any manual adjustments when there is no weight on them. Both our Balt and Cramer stools are wonderful choices for any space. What is the best rolling step stool? The Kik-Step Rolling Stool takes both safety and convenience to the next level. Bumpers all around the unit ensure that stools, walls, shelves and other furniture will not get damaged when they are moved. Non-skid treads ensure that feet stay firmly planted as items are taken down or returned to the proper location. The Kik-Step comes in an array of bright colors, which will add a fun feel wherever you keep it and make it easy to find when needed. You can never underestimate how helpful it is to have a step stool or step ladder close at hand. With Hertz Furniture&apos;s secure, user-friendly models you can retrieve virtually anything you need quickly and safely. This convenient item will make a great addition to your institution, whether you use it on a daily basis, or you keep it around “just in case”.